Melt the butter in a pan with garlic. Sauté onions and carrots until slightly browned. Add salt and pepper and then add in honey; cook for a couple of minutes. Add beer and reduce heat to low. Simmer until liquid is cooked off. Add pecans for the final 5 minutes or so, just before plating for your meal. 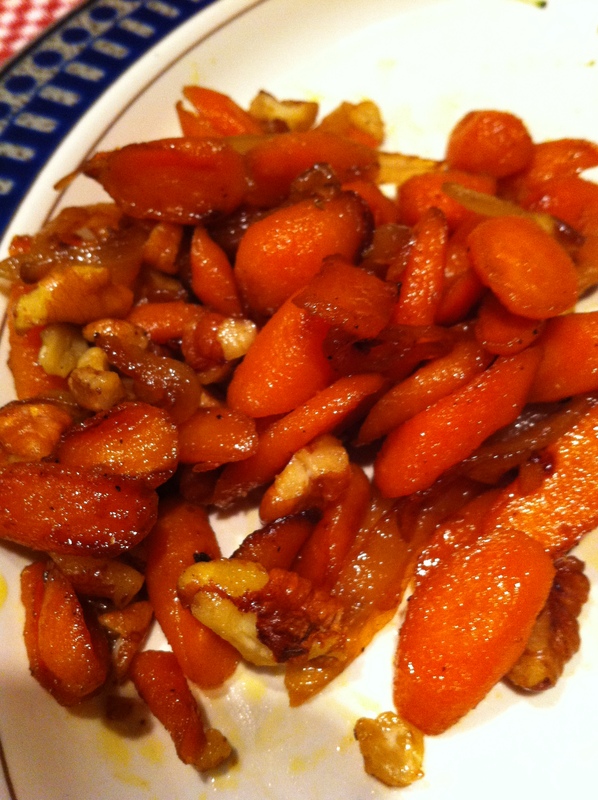 I think they turned out really well… just the right mix of sweet and savory. They were soft with just a touch of crunch. Tony’s 18-year-old brother who’s staying with us for the summer even said they were good. They have a bit of dairy and carbs (butter and beer) with some natural sugar (sage honey) and fat (pecans), but they have to be better for you than a loaded potato… And, with how light the rest of our dinner was, the small splurges were worth it.